Large rolled canvas prints that cannot be shipped pre-mounted to gatorboard. These prints come with a 2-inch margin for the customer to mount the print to stretcher bars at their local framing store. This painting depicts the great pattern of faith and resourcefulness in the life of Nephi, the son of Lehi. From his experience at the hands of his brothers in a cave on the outskirts of Jerusalem (1 Nephi 3 - 4) to the threat of starvation when his bow broke (1 Nephi 16), to time spent in the mountains learning how to build a ship (1 Nephi 17 - 18), to the threat of destruction upon the open sea, (1 Nephi 18), to his flight into the wilderness when he fled from the land of his people's first inheritance (2 Nephi 5), Nephi faced every wilderness of peril and personal weakness by praying as though everything depended on the Lord, and working as though it all depended on him. 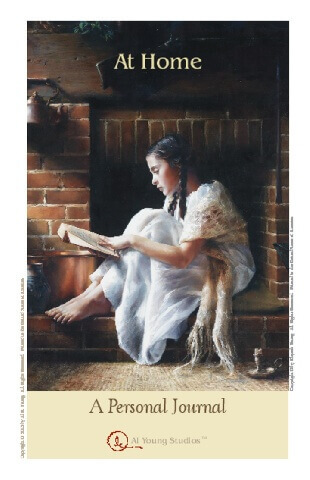 From youth to old age, the scriptural account of Nephi's life provides a rare and wonderful opportunity to observe--from an intensely personal vantage point--the development of a life of exceptional faith. When we meet Nephi, he is a young man confronted with what to do about his father's beliefs. "Eccentric" would be a mild description of the way his father, Lehi, appears to anyone preoccupied with worldly considerations. And Nephi's two older brothers--entirely fixated on wealth and social standing--presented formidable and violent opposition to Nephi and anyone else who tried to follow Lehi's teachings. Having preached to his neighbors in Jerusalem, as a contemporary of Jeremiah (circa 600 BC), Lehi was forced to flee for his life when his contemporaries not only rejected his preaching, but tried to kill him. He turned his back on an enviable personal fortune, uprooted his family, and traded life in a comfortable home in Jerusalem for a wilderness journey that lasted eight years. At the outset of the family's dramatically altered circumstances, Nephi prayed about his father's teachings and action, which so profoundly changed their lives. In response to his prayers, Nephi received relatively simple answers. Instead of visitations by angelic messengers or the opening of prophetic vistas to his view, his heart was softened toward his father's teachings. Nephi responded by exercising faith not only in his father's words, but in the gentle witness and promptings of the Spirit of the Lord. Praying, receiving answers, believing, acting in faith, encountering problems, was a pattern that repeated itself throughout his life. And throughout his life that pattern kept lifting him to greater strength, stamina, knowledge, and happiness. Throughout the story of his life, we see someone who kept God's commandments whether or not the reason for doing so was evident, and made the best of whatever happened after he had done his best. His family remained grievously divided on matters of religion and who would lead them. The scenery changed as the years went by and the family's circumstances improved dramatically, but the relationships and the age-old problems remained the same; except that instead of petty squabbling among siblings, the contention ripened into waring nations with one side intent only on defense while the other waged a war of hatred and, ultimately, annihilation. And if this wasn't enough, Nephi dealt with the personal challenges of being intensely gifted, creative, and sensitive. He was a widely diverse craftsman and artisan of the first order, a poet, an historian, a family man, a prophet, a builder, a warrior, a leader. So great was his faith and resourcefulness, that when his family's long wilderness journey took them to the shores of the sea, where the Lord told Nephi he would build the ship that would carry everyone across the ocean, Nephi's response was a simple question about where to go to find ore in order to be able to make the tools that would then enable him to build the ship. In the midst of adversity, circumstances can grow so dark that discerning the truth about even familiar surroundings can become difficult. 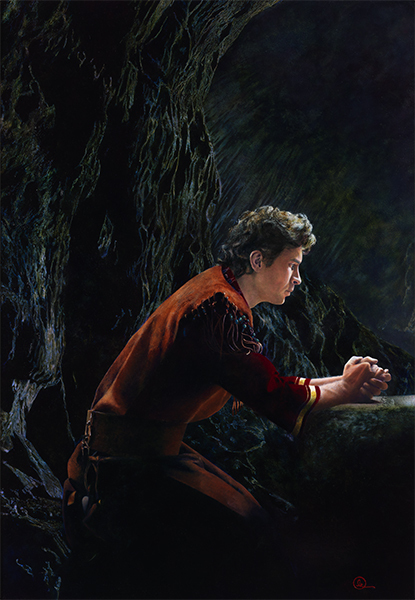 For example, while Nephi is illuminated by a light that originates beyond the boundaries of the image, his immediate surroundings appear as dark and foreboding as the walls of a cave. On the other hand, perhaps Nephi is kneeling at the base of a great tree. It's difficult to be certain. Among the things Nephi's father taught his children was the account of a dream in which a messenger, dressed in white, stood before him and commanded him to follow. It wasn't long before the journey became dreadful because, as Lehi described it, he found himself in a dark and dreary waste. Overwhelmed by the experience, he knelt and prayed earnestly for help. In response, the darkness opened into a vision wherein a great tree, representing the love of God, opened to his view and he went forth to it and ate of its fruit, which he described as the most wonderful and soul-satisfying thing he had ever tasted. One of the wonderful things about Nephi's understanding of what it means to be chosen of the Lord is that anyone can be chosen because faith is the only qualification. © By Al Young, All Rights Reserved. You may not print, copy, or reproduce this artwork or make derivative works from it without the prior written consent of the copyright holder. For permissions, please review our FAQ page. Al R. Young completes new oil painting - "Not Knowing Beforehand"
By Al R. Young Not Knowing Beforehand is the newest oil painting to be added to the line of original artworks from Al Young Studios.